After a difficult start to our project, we finally were able to create clear and feasible objectives for our project. We met with our sponsor many times about the logistics of our project and what was in the scope of our project. At first, we worried about how our project was going to be completed by the end of December if we did not have a clear vision for our project. One of the things that is really motivating our group to work hard in this project is the staff. After having a few interviews with different staff, we learned that many are only employed part time at ACE but volunteer the rest of the time, essentially making it a full time job. This really opened our eyes to the level of the staff’s dedication to improving ACE. They want it to succeed and thrive and are willing to whatever they can to make that happen. We all attended a volunteer orientation this week since we will be tutoring the students on Wednesdays and were amazed by some of the facts that our sponsor, Amy, shared at the orientation. I learned a lot more about ACE. I was especially moved by some of the conflicts and issues that these ACE students have seen and experienced. Their stories are amazing and their perseverance to excel in school really makes me want to succeed in this project. We hope our project will help the process development and marketing at ACE and most importantly, result in increased resources for the students so they can achieve their goals. 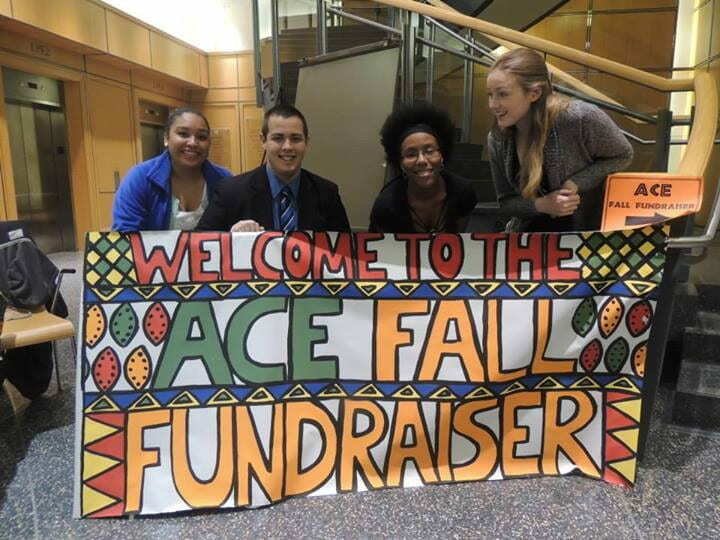 Although we only have met with one Board member, I feel that the Board wants to be more active in their efforts with ACE but just needs a little direction. This is really exciting for us because we want to allocate tasks and goals throughout every stakeholder of ACE and not just the staff. We also learned that the interns that ACE hires do not really have specific projects. This makes the goals we have for ACE that much easier to spread throughout the organization. Until ACE is able to hire more staff we want spread out responsibility for the marketing/ fundraising goals and tasks as much as possible. This week has been overwhelming but definitely successful. This past week was pretty difficult for Team Ace. We hit the ground running Monday, but somewhere along the way, we lost that driving force that propelled us forward. As moral support for our group, I knew it fell to me to give us that extra burst of enthusiasm that would raise our spirits and help us finish the week off strong. That, however, was not happening, for I myself felt suddenly disillusioned with our project. I felt it, my team felt it, and most importantly, I believed our sponsors felt it…from the beginning, yet were simply not telling us. Team Ace had surrounded itself with a chorus of “We can’t”s, “It’s not possible”s and “We are definitely going to fail”s. With this attitude, we trudged into the school-like building on Chatham St. where ACE is housed; no one too excited for the 3 hours of tutoring ahead. The Wednesday afternoon began like any other, with some students running around in the gym, playing soccer, a few playing basketball, and a first; two girls off in a corner practicing a choreographed dance. Instead of joining, I was content simply to watch. After the short recess, it was time for the kids to get to work, and the volunteers as well. The attendance for that day was lower than usual, and a lot of the volunteers milled around until a student needed help. After helping a student with chemistry, I excitedly sat down and started helping a student with their social studies homework. Barely a few minutes into the assignment, a familiar phrase popped up: “I can’t do this”. The girl quickly became annoyed by the assignment and no longer wanted to focus on it. I had seen a similar attitude with a student I had worked with last week. Both times when the students came across a strange word or a difficult concept, they would back off defeated, saying that they couldn’t complete the assignment. In both cases, the girls were very bright, and with a slower pace and rephrasing and repetition, the students were able to complete the assignment. One thing that saddened me was how quickly both girls limited themselves and what they could do. I thought…what would happen if they removed the word “can’t” from words they used to describe their ability? It is all too easy for others to tell you no, but when you tell yourself that you are unable to do something, that can be the most debilitating. Slowly a realization dawned that this same defeatist attitude, this same quickness with which the girl admitted her own inability to overcome the challenges her homework posed, mirrored the attitude of our group. We encountered difficulties, and instead of trusting ourselves and our problem-solving skills, we caved and lost hope. Well, no more. That litany of self-doubt and self-limitation ends now. We have 3 weeks down, and 4 to go. It is fair to acknowledge that we might not be able to complete everything we initially set out to do, but that does not mean we cannot still do some good for ACE. There is still enough time to leave a positive and lasting impact on ACE. Just as the power to understand and complete her homework resided in the student all along, so too does the power to complete our project reside in the members of Team Ace. This week our team went through an organizational jumpstart. After sitting down with our professors for two hours we were able to break down our project into all of its parts and assign jobs to each team member. Since then, we have experienced a week of unparalleled productivity. Everybody has been on their game and getting their work done. The project has also finally taken on a clarity that wasn’t there before when everyone was focused on the overall picture. Now that we all have our own goals and personal projects, we are able to see the bigger picture more clearly. We each have a stronger understanding of the steps we need to take to achieve our project goals. In this week alone we have gone through 20 books of background research, conducted six interviews with ACE staff and local nonprofit organizations, created a preliminary marketing calendar, a preliminary organizational structure of ACE and conducted a survey among the ACE staff. Needless to say our outlook on our project as much improved from what it was last week. We are feeling productive and empowered and ready to go. The worst is behind us and we can only continue to improve from here. With as much research as our group compiled, and as many other nonprofits our group has interviewed, the best teacher, we’ve found, has been to experience the problems we aim to solve ourselves. How simple it was to walk into our project and expect to find answers when our professors had explicitly warned us against that mind-set. We were told to split the project up into parts that each of us could own but didn’t truly realize how until our kind professors sat down with us and showed us. After our professors discussed the findings chapter privately with us, we thought we understood how to write it until we actually sat down to write it and realized we had no clue what a finding was (thank you, professors, for once again taking the time to work through the findings process with us). WCPC is lucky to have such invested professors who would teach us something once and then show us the second time. Thank you for helping us and for finally showing us that as many things as we tell and recommend ACE, experience is truly the best way to reach an audience. From the start of our project, our group has been asking the question, “But how can we be sure that the recommendations we make will be implemented by the ACE staff after we leave?” Our professors showed us that to tell a group is one thing but to sit down with them and work through a process is another. We must SHOW our sponsors what we mean when we recommend a process. This fish has been slipping away from us all term, but we finally have it in our grasp. If our research and recommendations are sound and will benefit ACE (and we whole-heartedly believe they will) then all that remains is to work WITH the staff to implement our recommendations. I suppose that this “ah-ha moment” is really only applicable to the processes we’re recommending them but the beauty is that the processes we recommend are the result of most of our other work. I have never had the pleasure of working with such an enthusiastic and caring project group as I had through this IQP. I never did like community service before this project, but now I understand why people would devote long hours to help a community in need. I have learned so much from my team, our sponsors and our advisors through the course of this project and I will look back on this experience with a sense of accomplishment for what our group has contributed to ACE. This project experience has definitely been an interesting one. I often find myself thinking in terms of marketing and benefit per cost analysis. I have really learned a ton, not only about fundraising and nonprofit organizations, but about team work and how a determined individual can leave a lasting impact on a child. I entered this project feeling neither here, nor there, expecting the project to be just another required WPI course. Instantly however, ACE captured my heart. The mix of dedicated and inspired staff, the driven and inspired volunteers, the diligent and heartwarming students… there was no way that I would not become completely invested in this project. I really hope that our time at ACE was beneficial. I look forward to volunteering at ACE in the time to come. These last 14 weeks have definitely been a highlight of my time at WPI. I worked with three amazing people that challenged me and made me learn a lot about myself. I grew as a person and as a group member. Although our project took a few unexpected turns, we pulled it together and accomplished our goal. This experience has been a wild roller coaster that is now coming to an end. I will carry with me the knowledge I have gained as well as life long friendships.